Wunderground for closest location is Stinson Beach. Wind Station near Mt. Tam is Big Rock it is at 1500 ft. so will help with wind speed. Mt. Tam is a regulated site that requires a minimum of a P3 with a sponsor sign off to fly. The Bay Area Paragliding Association “BAPA” is the USHPA club that manages the flying program. The site administrator is Wally Anderson. Contact Wally if you have the qualifications and forms for Mt. Tam or need to arrange a sponsored flight. Tam is flyable year round, but is most soarable duirng the winter season when instability is present. During the summer, even short 10 minute flights are well worth the effort. There are not many places as beautiful as any of the 3 launches. Strong Winds at the beach or launch. Winds above 10 MPH at launch can make it very difficult to successfully reach the LZ. If whitecaps are close to the beach, expect possible penetration issues if the wind comes in or reaches the beach. If the whitecaps are filled in it would not be recommended to fly. Fog (Do not fly if fog obscures a clear view to beach or shows signs of filling in). Check the tides visually prior to all flights at Mt. Tam. Private Beach just north of the LZ, (we are not allowed to land there, please do not). Just north of the LZ, the beach is private and when you walk the LZ, please notice the sign. Please make sure when landing on the beach, to make sure you set up to land south of this sign. Problems with this issue could impact our ability to fly Mt. Tam. Find your way up to Pantol Campground (directions from South and North are below) at the summit of the Panoramic Hwy that goes from Mill Vally to Stinson Beach. It is required for all pilots to sign in at the Ranger Station prior to flying. After signing in, take the road that goes to the summit up about two miles to the 1st intersection. Turn left onto Bolinas Ridge Road. All 3 launches have a marked 4 x 4 pole with the launch number. A Launch – About 1/4 mile up this road is A launch (aka Launch 1). It is on the left side and there is a dirt parking area. B Launch – A couple turns after B launch (aka Launch 2), on the right is a paved parking lot. The launches are on the west side of the road. C launch – About 1 mile past B launch(aka Launch 3) is another paved parking area on the right. The launch is on the hill on the west side of the road. From the South, this map shows the route to Pantol from US 101 exiting at the 1 South exit just after Sausalito. From the North, this map and direction show the route to Pantol Ranger Station. Find your way to Downtown Stinson Beach. Continue North on Highway 1. Less than 1/4 mile past downtown, on the left will be an intersection on the left with a “Y” of two roads. The right half of this is Calle de Arroyo, head north on this. About 1/4 mile down, just before the private, gated entrance to Seadrift, there is a dirt parking area on the right. On the left is a small lane called Walla Vista. 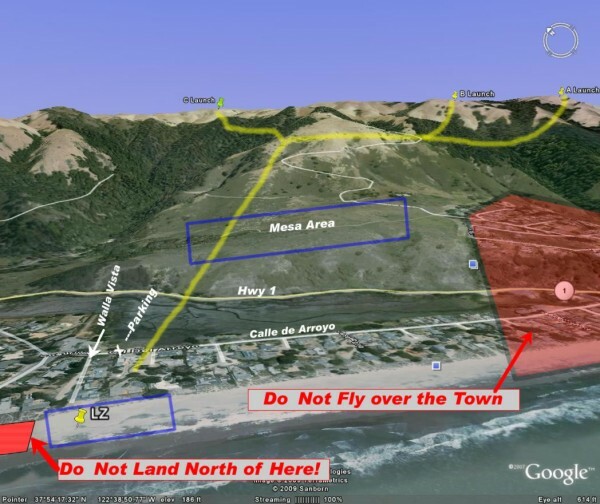 The LZ is the beach at the end and just to the south of Walla Vista. 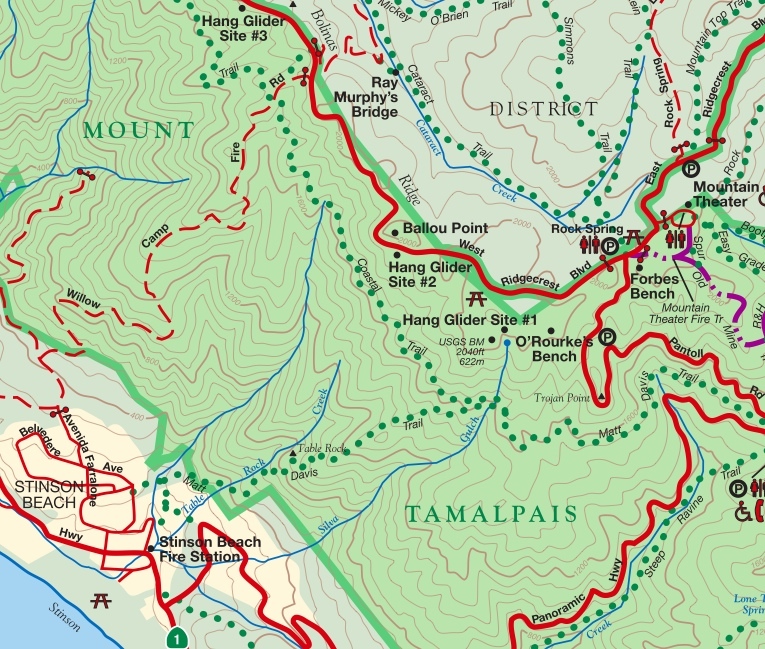 Below is a map showing the trails that are on the Bolinas Ridge (the ridge on Mt. Tam where all 3 launches are) between the LZ and Launch. I would estimate about 1.5 hours to hike to Launch 2 from the bottom. To view a full size image of this map, it is inside the Mt. Tamalpais brochure PDF.